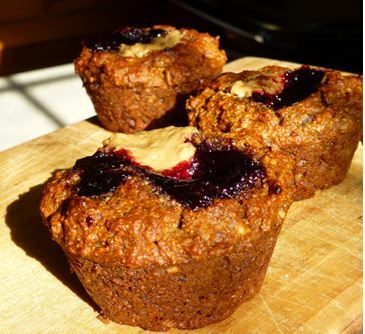 Erdnüsse et Castagne: Peanut butter makes you happyyy - PB & J Muffins! 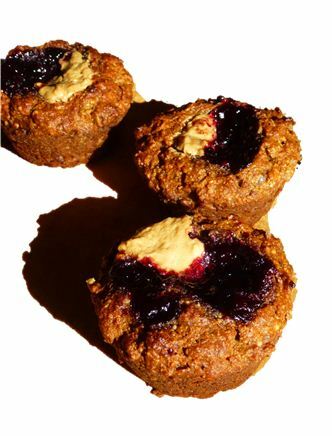 Peanut butter makes you happyyy - PB & J Muffins! When you need a peanut butter hit...well, usually I'd recommend grabbing a spoon, a banana and just going for it. But sometimes, you're craving a delicious, hearty, life-fullfilling muffin. You know the craving. Or at least I hope you do. Dense, carb-y, warm, fills you up with goodness, big, hearty ahhhh, need I go on? Ok, so clearly I'm not that good at describing muffins. I hope you will forgive me. So my friend and I were deliberating over which jam was the best with peanut butter (I was out of bananas, you see...SHOCKING. I KNOW.) So that's what we do when we're bored. Anyway, she suggested blackberry. Actually no, she didn't suggest it, she swore by it and wouldn't make exceptions for anything else. Even her mum's apricot jam. That's a big claim. Lucky for us, my cupboard was full of blackberry jam, homemade and amazing :) And even luckier for us I had found a recipe that just probed at my weak resistance, demanding me to try it. And thus, the humble peanut butter and jelly/jam muffin was born. Say hello, he's not shy. Deliciously peanut buttery, sweetened naturally - only by fruit! Healthy, yummy and perfect for any time of the day (or night). I'm not the only one who stays up really late to be hungry and have a muffin am I..? Don't answer that. And in case you haven't been persuaded yet: they're quick to make, too! Feel like a muffin now?? Go! GO TO THAT OVEN! 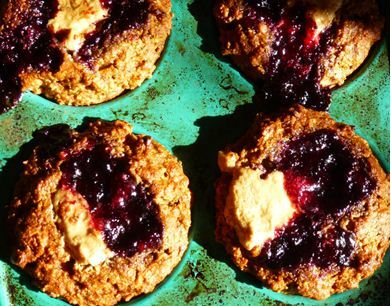 you will be sitting in muffin-y bliss in less than half an hour. Just look: how could you resist..? 1) Preheat your oven to 180C and line a muffin tin with 12 muffin papers or lightly grease them. 2) Whisk the eggs, applesauce, oil and date paste together. 3) Add the peanut butter, salt, baking soda, baking powder and apple cider vinegar, and whisk to combine, making sure the peanut butter is evenly dispersed. 4) Then whisk in the flour, almond meal and oats. 5) The batter will be quite thick, spoon it into tins and top with a dollop of blackberry jam and another dollop of peanut butter, gently swirl them and push them down a bit into the muffin (this works if your jam holds it's shape pretty well, otherwise make a bit of a hollow before putting the jam on). 6) Try not to let the jam get too close to the edge. They will keep covered for a few days, but they won't last that long, believe me! Freeze them as a snack for later. - I haven't tried, but the original recipe uses flax eggs for vegans. - Date paste is just soaked and blended dates into a paste, I usually always have some in my freezer. Just chop and soak lots of dates for a few hours then let them simmer for a few minutes and then let them go cold, drain and blend them adding some of the liquid if your blender needs. - The original recipe uses almond meal, I used cashew due to the over-abundance of cashews in my house and the rather limited stock of almonds. Either will work and both will be delicious. If you want to make your own just blend nuts in a high powered blender or food processor until they are fine and sandy.